For over a year now my youngest son has been asking me to finally finish his bedroom, major mom fail on my part. I have no good reason as to why I didn’t finish it sooner, it just never happened. 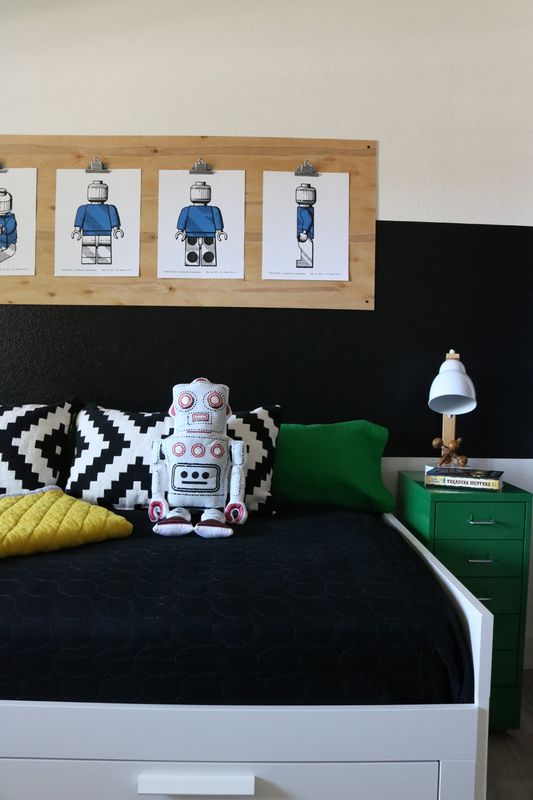 The plan for his room design has always been to have black and white (surprise, surprise) with some pops of color. 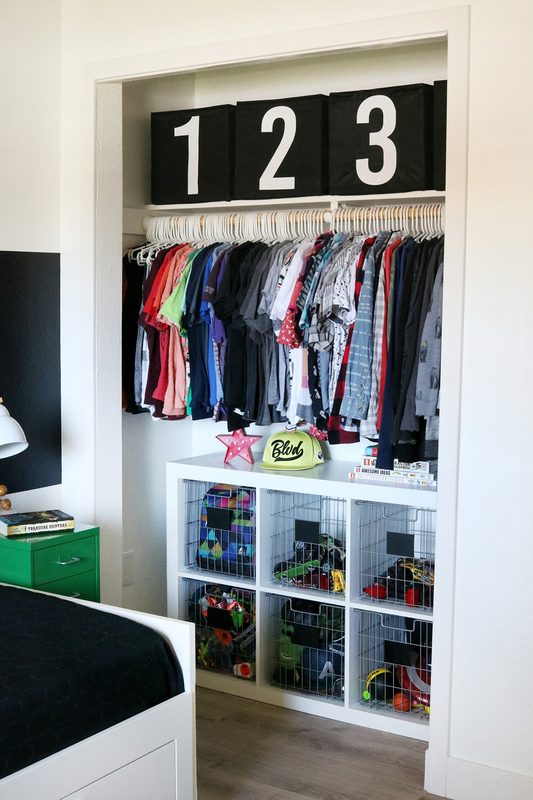 One area that really needed to be focused on though was his closet, it was just pretty much thrown together and very outdated. 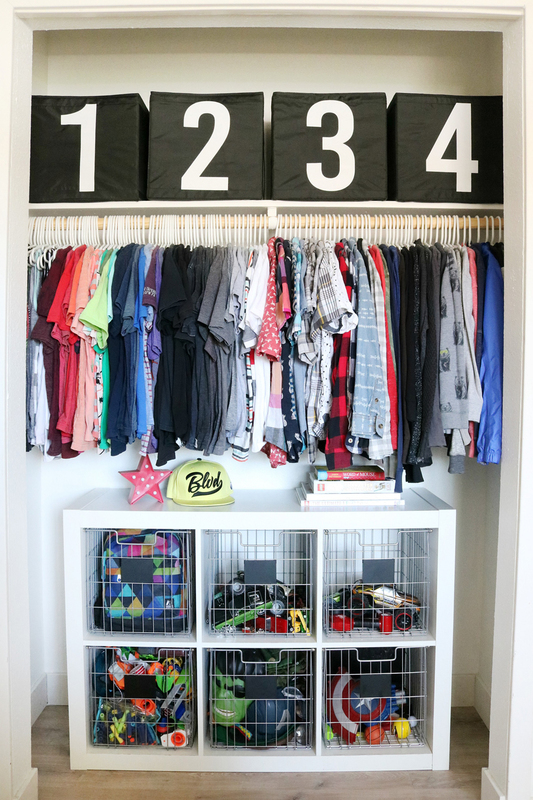 Today I’m sharing these Boys Room Easy Closet Organization and Decor Ideas to hopefully help inspire you. 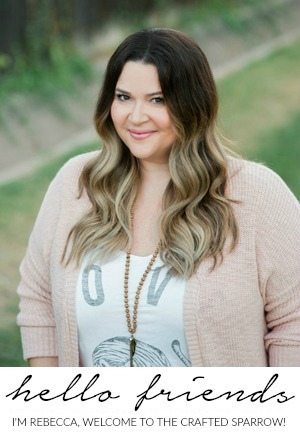 So let’s take a look at the BEFORE photo, shall we? It’s pretty bad. Inside of the closet has never been painted since we’ve owned this house, by the way, we’ve owned it for 13 years. I don’t even know why we’ve never painted it before, it was a lovely shade of Navajo White I’m sure before this refresh. 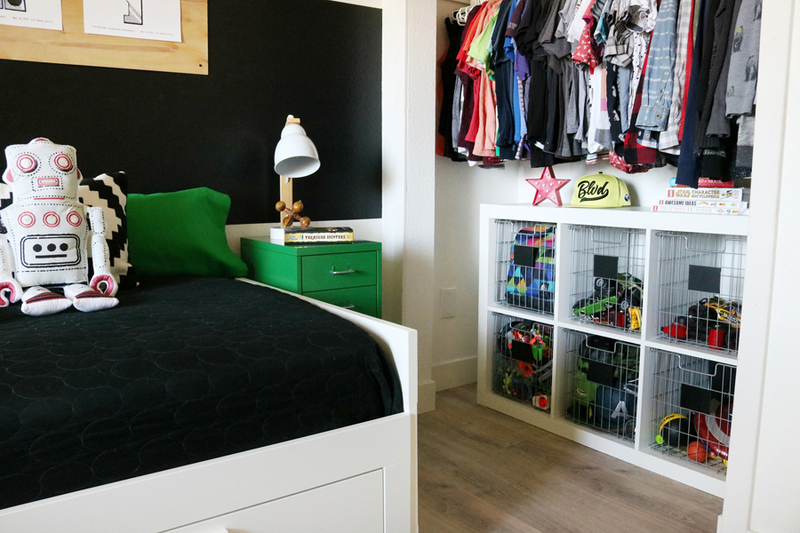 The closets in our boy’s rooms don’t have closet doors, the rooms are small in size – 10 x 10′ to be exact. So having closet doors made it seem smaller. I’ve always kept things pretty organized with bins and baskets but in this closet especially it was just too dark and gloomy. Pair that with a kid who doesn’t love cleaning and it can turn into a huge mess real quick. Notice the awesome modular cube storage system, it happens to be about 15 years old and from our first apartment. It has definitely overstayed its welcome and needed to be updated badly. It was also too big for the space, leaving no room for the side bins to be pulled out. 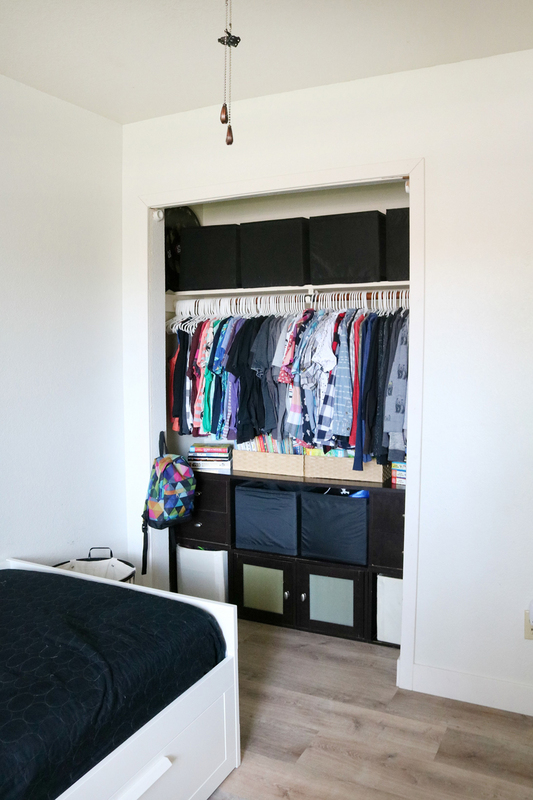 We already had the majority of the furniture pieces for this room in place, the only real items I needed were for the closet. 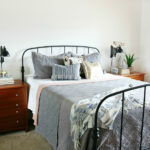 I wanted something new and bright to keep it organized, some decor pieces like a rug and wall decor for above the bed, and some odds and ends. 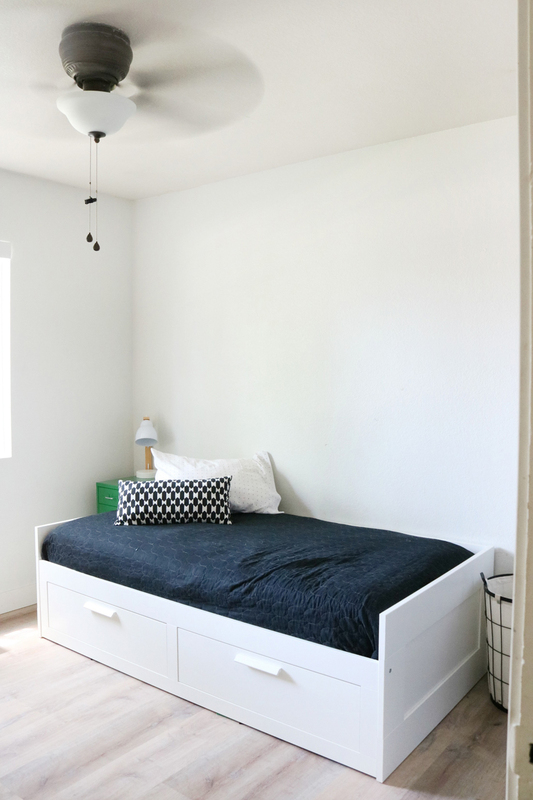 The walls were already a super light shade of gray, but it needed to be freshened up as well. I ended up painting everything a crisp white, polar bear from Behr paint. It just made everything feel clean. The after is so much better, don’t you think?! 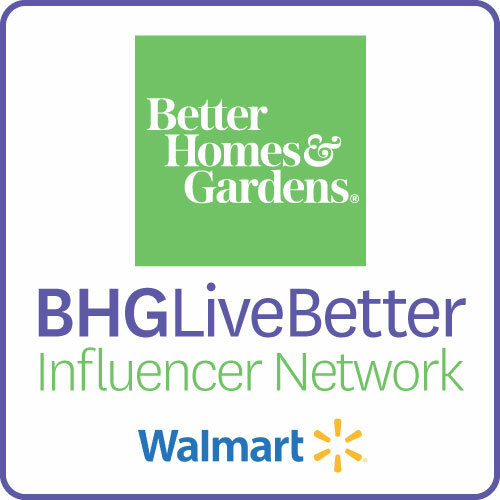 The first piece I added was the Better Homes & Gardens 6 Cube Organizer in white. It fit perfectly inside the closet and left room on both sides to store pillows from the bed when not being used. 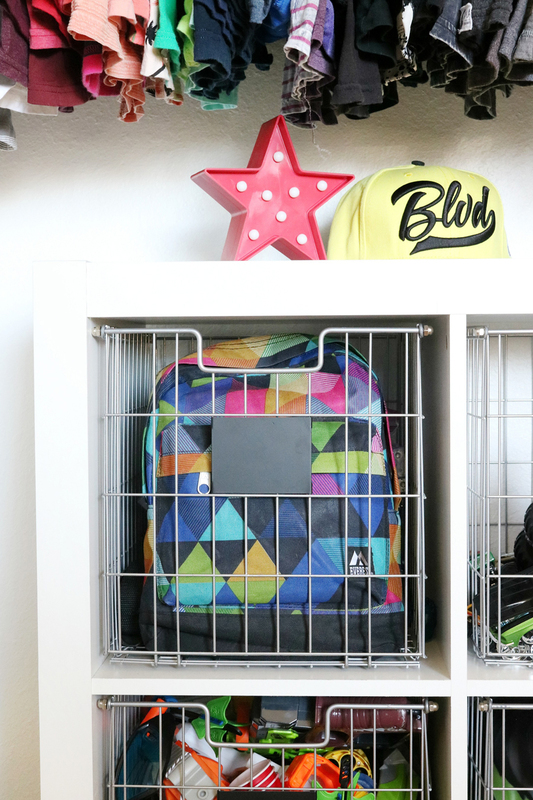 I’m a huge fan of these storage systems, they keep everything tidy and make the space feel super organized. Since redoing the flooring throughout the whole house several months ago my son has missed having carpet on his bedroom floor, the silver Better Homes & Gardens Nylon Shag Rug was such a great fit for this room. It’s such a soft rug, and I love the texture it adds. The large black storage bins we already had in the closet before. I decided to just give them a fun update with some white iron-on vinyl. These bins hold extra hangers, stuffed animals that he’s not ready to part with yet, and books that his brother has passed on to him that he’ll grow into some day. Something I’ve always done in our closets is to keep the clothing organized and color coordinated. This is especially a must if you have no closet doors on the closet. All the hangers are white, they all match and everything is hanging the same direction. 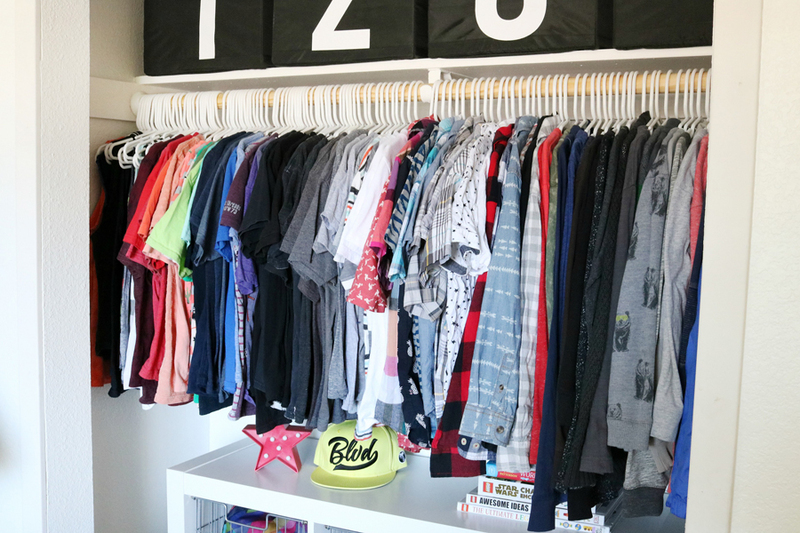 I organize everything in sections – tank tops, short sleeved t-shirts, short sleeved button downs, long sleeve button downs, long sleeved t-shirts, then jackets and sweatshirts. I also love seeing all the colors in rainbow order. A bit too much? NEVER! Yes, my kids know to keep it clean and to put their clothes away in the right spots. Hopefully, their wives will very much appreciate this someday. 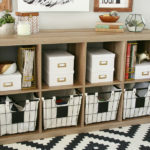 When I was shopping for the 6 cube organizer I wanted bins or baskets that I hadn’t seen before. 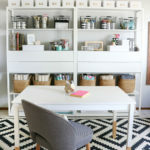 I totally lucked out with these amazing Better Homes & Gardens Wire Storage Bins! They are perfect and exactly the look I wanted. I love the little chalkboard plates they have on the fronts for labeling. 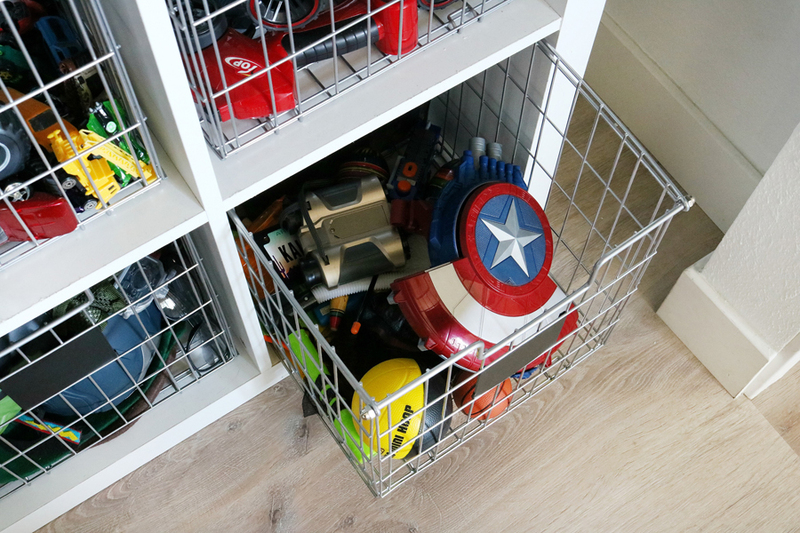 Granted, very small toys will go through the bins so I kept smaller things organized elsewhere. 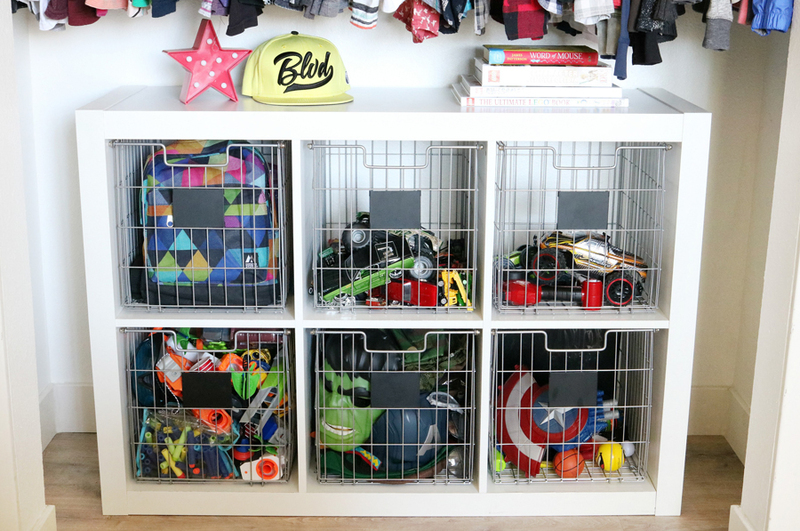 This was perfect for storing all his larger toys. 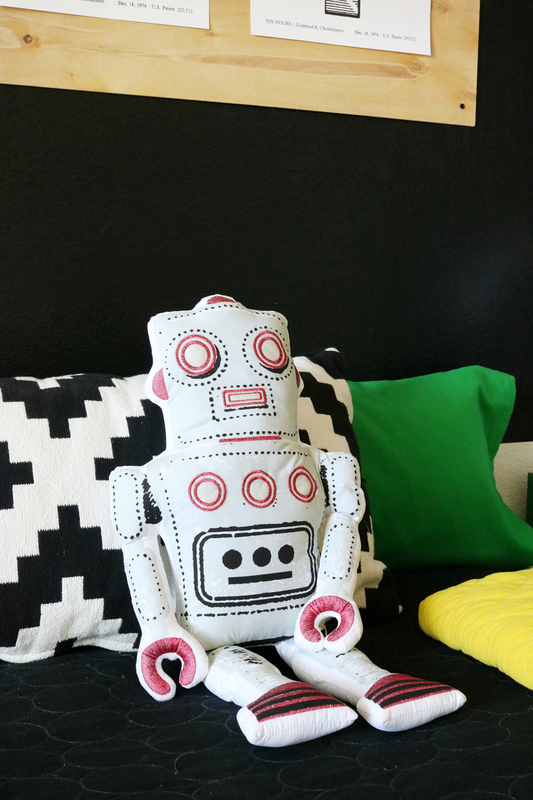 When I found the Better Homes & Gardens Robot Pillow I knew he needed it. He’s obsessed with building robots right now, he loves it. 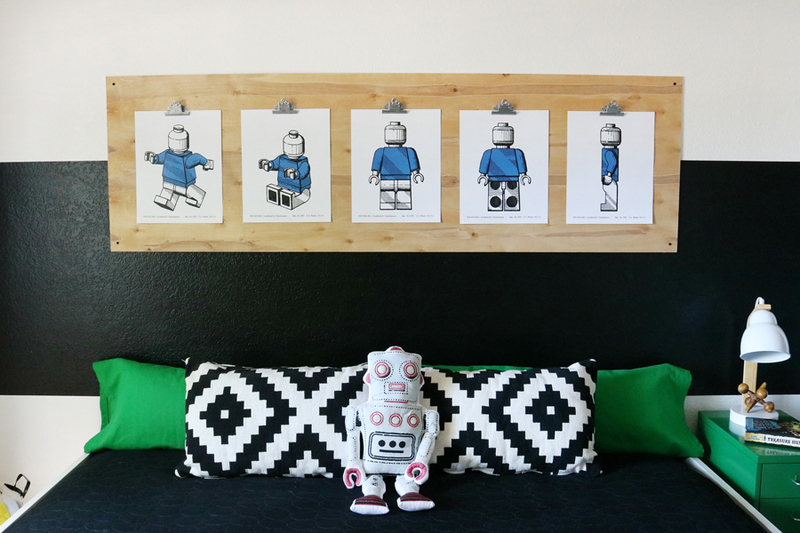 I knew I wanted to create something larger for this wall to hang decor from. I have a gallery wall going on the other side of the room and didn’t want this side to be super busy. After painting a large black stripe on the wall I found a 1/4″ thick piece of underlayment wood that I created a hanging system for some 11 x 14″ art prints. Look for a post on that coming soon. 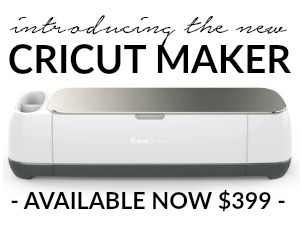 We also ordered a new Better Homes & Gardens 10″ Gel Infused Memory Foam Mattress for his bed. 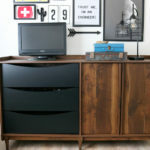 We already have it in our other son’s room and loved it. I forgot to snap a pic of the mattress unrolling process but it’s so fun to see when they are shipped to you. 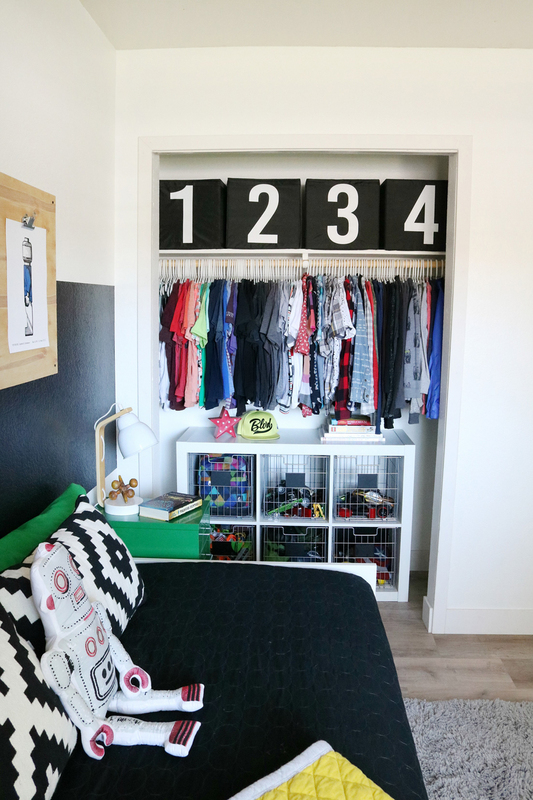 I love how this space is coming together, these Boys Room Easy Closet Organization and Decor Ideas were exactly what it needed. I can’t wait show you the entire room once I’m done with the other side. Looks amazing! Bet he LOVES it! 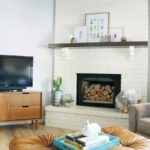 These room decor tips are superb. 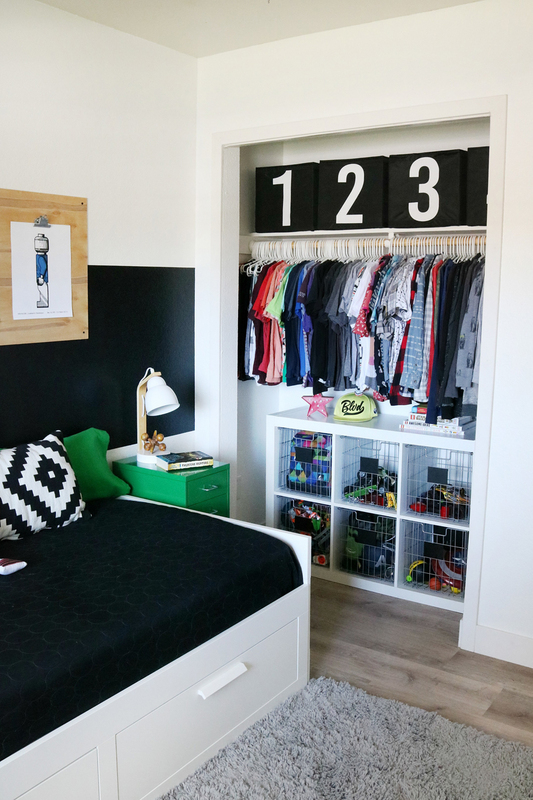 It is not difficult to organize boy’s room. But, this post has made it additionally simple.